RF denervation involves lesioning the nerves that transmit pain from an area of the body using a needle and electric currents. When an electric current is passed through the tip of the needle, it will cause an electrical burn the size of a pea. The needle will be placed over the nerve(s) that transmit the pain, in such a way that, by lesioning them, pain transmission will be prevented. RF denervation can be applied to several parts of the human body, and though the most commonly treated area is the spinal column, other joints, e.g. the hip, are also frequently treated using this procedure. WHAT WILL HAPPEN DURING THIS SURGICAL PROCEDURE? First, the anaesthesiologist will insert a venous line to administer the drugs that will sedate you and prevent you from feeling any pain. You will only feel a bit of warmth in the vein for a few seconds, after which you will fall asleep. Next, the skin is disinfected with iodine (if you are allergic let us know so that we use other products). The doctor will insert a long, thin needle until its tip is near the nerve that we wish to lesion to control the pain. X-rays will be used to check that the needle is inserted into the correct place, and then the nerve will be stimulated using an electric current to check that the tip of the needle is where it should be and not over any other nerve that we do not wish to lesion. If this was the case, the needle would be relocated so that it is exactly on the nerve that we want to lesion. Once the needle is perfectly in place, an electric burn the size of a pea will be produced, causing a lesion in the nerve that we want to transmit the pain. The process will be repeated in all the nerves that we want to lesion to control the pain, leaving no cuts or wounds, only punctures. The procedure itself usually takes about an hour, though another 30 minutes are needed to prepare the patient and another half an hour for the patient wake up. Patients must remember to fast for 6 hours before the procedure. This means no eating or drinking, not even water, otherwise the anaesthesiologist will not be able to apply sedation, and this procedure is unpleasant under local anaesthesiologist only. 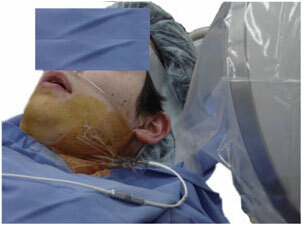 After the procedure, the patient should remain in the recovery room until you are fully awake. Once out of the operating theatre, it is strongly recommended to eat something to restore blood sugar levels. To return home the patient cannot drive, because, due to the anaesthetic medication used, they will be a bit dizzy and will not have very good coordination. Usually, the day of the procedure the patient will feel well. From the following day onwards, they will feel a bit uncomfortable in the treated area due to the oedema of the small burns that led to control the pain. This feeling will disappear in a week but will require analgesics and an anti-inflammatory agent, to be taken with an antacid protector. The majority of patients can return to work in 3 to 5 days after the procedure. The end result is usually reached in a month, but sometimes the improvement slowly continues further. The amount of pain relieved is 80-90% in 80-90% of patients. The duration of the relief is variable, but, in general, the pain returns over time, usually between 3 to 5 years, because nerves lesioned using RF grow again over time. At this point we can repeat the procedure again. One way to know the possible outcome to expect with facet joint denervation is to inject local anaesthesia into the facet joints. If the pain disappears for a day or more, a satisfactory result from facet joint denervation is to be expected. If there is no pain relief with facet joint injection, it is unlikely for the denervation to be effective. If you are pregnant, or if you think you might be, let us know. You cannot get X-rays. If you are taking aspirin, anti-aggregating agents (blood thinners), or anti-coagulants, you should stop taking these medications one week before the procedure. Make sure you have informed us about ALL medications that you are taking, in case they could interact with the medication that we are going to give to you and create problems. If you have ever had any allergies to any medications or to local anaesthesia, let us know. The main problem derives from allergies to local anaesthesia, but this is extremely rare. Neighbouring nerves can also unintentionally be damaged, but this is also extremely rare. Usually, only a hematoma will crop up, and this hematoma will just be spontaneously reabsorbed within a few days.